Remember High School P.E. Class? If you have searched for the five components of physical fitness and are now reading this article, there is a good chance that you first heard about the five basic components of physical fitness many years ago. Your parents and teachers told you to get off the couch, out of the house, and exercise because it’s good for you. Exercise is indeed good for you, but in order to get the most out of exercising, you should follow a balanced exercise program. That is where the five components of physical fitness come in. There is no easy answer to that question. Physical fitness means something different for everyone. If you want to find a definition that works for almost everyone, you should visit the Definition of Physical Fitness. The following five aspects of physical fitness are each very important to your health, because if you have all five components covered through a balanced exercise program, you are likely to stay healthier, be happier, and live longer. You can look at the five components of physical fitness as markers of true fitness. You are only as strong as your weakest link, and if you are weak in any of the following five areas, you should work at them to become a more balanced, physically fit person. Cardiovascular exercise, also called cardiopulmonary exercise, or simply cardio, consists of aerobic physical activities lasting longer than 90 seconds. To better understand the terminology, you should know that cardio- refers to the “heart”, vascular means related to blood vessels, and pulmonary means related to the lungs. Cardiovascular or cardiopulmonary endurance is your physical ability to maintain aerobic exercise for prolonged periods of time. Physiologically, cardiovascular endurance refers to the efficiency of your heart, lungs and vascular system’s delivery of oxygen-rich blood to your working muscles during activities that last longer than 90 seconds. Cardiovascular endurance is very important because the more fit your cardiovascular systems becomes, the healthier your lungs, heart and vascular system will be. If you demonstrate high levels of cardiovascular endurance during exercise, you also have a more efficient heart, lungs, and vascular system while at rest. This means less stress is put on your heart and lungs around the clock, enabling you to avoid illness and live a long, healthy life. Many argue that cardiovascular endurance is the most important of the 5 components to physical fitness. Muscular strength is the amount of force your muscles can exert against resistance for short duration, anaerobic (without oxygen) activities. Resistance includes external objects such as free weights or household objects, or even own body weight during bodyweight exercises. Physiologically, muscular strength it is the ability of your cells to supply muscle energy in the form of ATP (adenosine triphosphate) to your muscle fibers for concentric, eccentric and isometric contractions in time frames ranging from 0 to around 15 seconds. 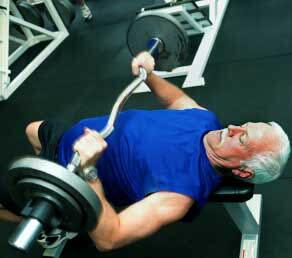 The primary reason why muscular strength is important is its effect on activities of daily living (ADLs). Efficiency and safety during ADLs are two of the most important reasons for becoming proficient in all 5 components of physical fitness. The best way to build fitness for performing ADLs is through functional training, or exercises that mimic the activities you do in daily life or your sport of choice. At the very least, to be physically fit in the muscular strength department, you should demonstrate the basic muscular strength needed to efficiently your ADLs. While ADLs vary from person to person, you can also consider activities such as push-ups, pull-ups, and carrying heavy objects to be ADLs. Each of the 5 components of fitness depends on the others. Poor muscular strength can negatively affect aerobic fitness and muscular endurance. You can use all forms of resistance training to increase your muscular strength. If muscular strength your weak link in the 5 components of physical fitness, you need to start weight training. While muscular strength deals with short duration muscle contractions, muscle endurance deals with sustained muscle contractions and other anaerobic activities lasting less than 90 seconds. Muscular endurance is the bridge between muscular strength and cardiovascular endurance. 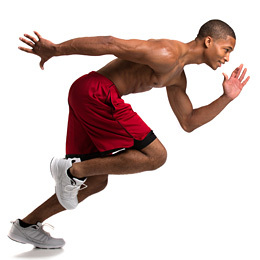 In order to be have a fit cardiovascular system, you must demonstrate muscular endurance. While muscle strength deals primarily with fast-twitch type II muscle fibers, muscular endurance deals with primarily slow-twitch type I muscle fibers. Your body contains both types of fibers, but only anaerobic exercises which last longer than around 15 seconds and less than 90 seconds strengthen your type I muscle fibers. Learn all about how your resistance training workouts can improve each of the 5 components of physical fitness through different exercise selection, sets, reps, weight training volume and weight training splits. Flexibility is the range of motion possible for each of your joints or groups of joints. To some degree, your flexibility determines the efficiency of your muscles. Increased flexibility has also been associated with decreased risk of acute and chronic (overuse) injuries. Poor flexibility can directly affect cardiovascular endurance, muscle strength, and muscular endurance. Physiologically, flexibility can include extramuscular factors, such as range of motion at a joint, as well as intramuscular factors, such as hypertonicity (knots) within the muscles themselves. Learn in detail why flexibility is very important for your muscle balance, which affects all 5 components of physical fitness. Learn how to increase flexibility, decrease tension and soreness, and correct postural problems using self-myofascial release with a foam roller. Learn all about the Cumulative Injury Cycle including how and why flexibility training prevents injury. 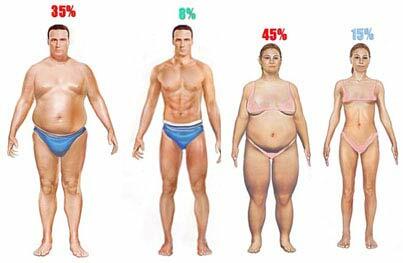 Body composition is the percentage of your body’s tissues which are composed of fat versus tissues which are fat-free. The easiest and most common way to look at body composition is with a two-compartment analysis which compares the amount of body fat you have with your lean body mass, which includes muscle, bone, water, and organs. It takes expensive equipment for a three-compartment analysis which isolates bone mass, which can also be considered an important part of body composition. You could say body composition depends on the other components of physical fitness. Focusing on the other four aspects of physical fitness will naturally lead to improved body composition over time. Having a poor body composition has many negative physical and psychological effects, such as increased chance of chronic diseases and depression. As mentioned previously, improper exercise habits and poor lifestyle choices can not only lead to being overweight or obese, but decreased bone mass associated with osteopenia and osteoporosis. If you want to know if you are physically fit according to the 5 components of physical fitness, you should learn about the cheap and effective ways to estimate your body composition. If you think your scale weight is too high, you may want to estimate your lean body mass as well as fat mass. Scale weight alone does not accurately reflect the more important metric of body composition. From body composition data you can find out how much fat you should lose to accomplish your weight loss goals while sparing your lean mass. Check out this Fat Loss 101 article if you are new to fat loss. Which of the 5 Basic Components of Fitness is the Most Important? You cannot rank one of the health-related components of physical fitness as more important than the others, as all 5 components of physical fitness are interdependent upon each other. Finding which of the 5 components is most important for you to focus on is as simple as identifying your weakest link. If you are very strong but cannot jog a mile without getting out of breath, you need to focus more on your aerobic exercise. If you are very lean and have high cardiovascular fitness but you cannot touch your toes, you need to work on your flexibility, and so on. In-depth information about each of the five components of physical fitness. If you want more information about why the 5 components of physical fitness are important, read this article to discover many more benefits of exercise, including the not-so-obvious benefits you don’t already know. You can possibly improve 3 of the 5 components of physical fitness on any cardio machine, provided you work hard enough. Learn tips that will help you operate the cardio machines properly to get maximum cardiovascular benefits. If you learn about your body composition, one of the 5 basic components of physical fitness, you will be on your way to being in the best shape of your life.